We install high-quality countertops you can depend on! When looking to renovate a kitchen or bathroom, you will need to make a decision on the type of countertop you want. 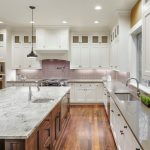 Countertops can be made from all different kinds of materials; however, we recommend granite for the best granite countertops. Granite is the ideal choice for the best granite countertops because of the many benefits it has to offer. Chefs, whether professional or beginner, all agree that granite is a great surface to work on. Its durability can withstand cold and hot surfaces in addition to heavy equipment. Its smooth surface is great for rolling out dough, and with its low maintenance, easy-to-clean surface, cleanup is a breeze. It’s no wonder so many people choose granite when they’re looking for the best countertops! At the Granite Guy, we offer over 80 slabs of granite to choose from. With so many options, you’ll be sure to find the right slab for your home. What’s also unique about granite is that no two pieces are alike. Each piece is different, so when you have your granite installed, it makes your home that much more unique from others. Ideally, granite countertops are installed in kitchens and bathrooms, but they can also be placed in vanities and laundry rooms. With its high popularity and lower-cost, granite is the number one choice of homeowners everywhere. In addition, it’s also a great investment if you’re looking to sell your home down the road. If you’re looking to make a change to your Westerville, Ohio home, look no further. Call us today to learn how you can have the best granite countertops.